The MACS-lift is a full face lift that can be performed with local anesthesia on an outpatient basis. The operation can be completed in two hours, and most patients return to normal activity within two weeks. Its minimal duration makes it both safe and practical for use in conjunction with laser resurfacing and other facial cosmetic procedures. This remarkably effective technique is minimal in every way, resulting in a shorter scar, reduced morbidity, and few complications reported in more than 200 cases. This beautiful atlas details the MACS-lift operation in its entirety. Every step, from first to last, is clearly described and accompanied with photos and illustrations to explain the nuances of the technique. 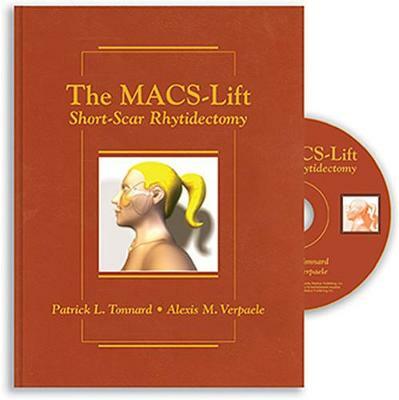 A chapter devoted to case examples presents some results of simple and extended MACS-lifts. Additional chapters discuss secondary and ancillary procedures as well as complications and problems that may arise. An in-depth DVD accompanies the book and demonstrates every aspect of this innovative surgery. Additional animation complements descriptions and emphasizes key concepts contained in the book. The video shows the entire procedure from preoperative markings to final suturing of the skin flap with preoperative and postoperative results.